Last year, I was very kindly nominated for this award by Katherine, who had in turn been nominated by Sophie (please do have a look at their fab blogs). I had been struggling to put together my own list, not for want of nominees for my seven favourite blogs, but for the list of things I share about myself. Whilst procrastinating, I have now been nominated for this award by another blogger, Emma, whose blog 'Oooh Betty' is another firm favourite of mine. This action has spurred me on to completing my own list, although I will be sticking to seven favourite blogs and not the fifteen Emma talks about. If you are in need of more than seven recommendations, please look at my side bar towards the bottom of this page. 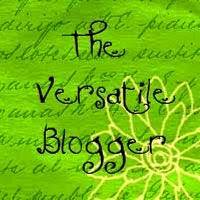 All of the blogs listed here I read regularly and I enjoy them all. As the tradition goes, I will now nominate seven bloggers whose blogs I read regularly and also tell you seven things about me that you might not know. Rachael only began sewing just over a year ago and makes the most gorgeous things which she sells at craft fairs and on Folksy. She has also been really supportive of all crafters, but those just starting out in particular, always ready and willing to share hints and tips. She has patiently answered many of my questions - thanks again Rachael! I have only recently found Angela's blog and I am always excited when she posts as she makes some really clever things. I particularly loved this kitchen that she made her son for his second birthday. Georgina is a professional textile artist and maker whose work is really quirky and eye-catching. I really love the little monsters she makes and enjoy reading about her adventures. She has been known to leave little crafty presents dotted around her home town, which is such a lovely idea. Emma is also quite new to craft and blogging and is someone else who strikes me as a person who is willing to go out of her way for complete strangers in the name of craft! Crochet is her particular passion and you can find her wares on Etsy. Kelli (or Mrs DG as I am used to thinking of her as) is a busy mum of four who also runs her own business from home. Her blog is a lovely insight into her life, her family and hobbies and has a definite heart-warming feel to it. Laura's blog is another recent read. She also sells at craft fairs and makes beautiful home wares and gifts. Andrea's blog appealed to me initially because she makes mostly bags and uses oilcloth, which is a material I enjoy working with. She was also very helpful when I was making enquiries about sewing machines. 1) I hold a full motorbike license. Although, sadly I had to sell my bike because it was rotting on the driveway, I am capable of riding big bikes and hopefully one day when I have more time I will get another. 2) My feet are big. They are not only a size 8 but also quite wide which makes shoe-buying a bit of a nightmare for me. I will never love heels and tend to buy decent shoes which I live in until they die. 3) I love to sing, especially in the car. I'm not the greatest of warblers but I enjoy it. My family doesn't. 4) I think I'm addicted to Vaseline. I've been using it to moisturise my lips since I was about fifteen and I am never without a pot. There are little tins dotted everywhere, in the car, my pockets, in all my bags and I get a bit panicky if I don't have any with me. I sometimes wonder if the constant use has led to my lips losing their self-moisturising properties; they feel horrible without Vaseline on. The whole family hate me kissing them when I've just re-applied it (all the time then). 5) My favourite colour is green. I have green eyes, which I didn't like when I was little because I remember for one assembly in primary school the class was arranged into eye colour - and I was the only one with green eyes and had to sit alone! Now, I love having green eyes, they seem to change with my mood and if I have a good old cry for any reason they go a really deep green. Mr Magpie also has green eyes, as do both our boys. I buy quite a lot of green clothes and my customers will know that my bags and labels are green. 6) I am more of a cat person then a dog person, although I do like dogs. I just don't like them licking me or trying to sniff me. I have two tabby cats who are fiercely loved by me and my middle child and tolerated by the rest of the family, who are more doggy types. We don't have a dog, and no kids, we're not getting one, sorry. 7) My actual first name is not Beth. I was named Helen Elizabeth but never really liked my name. In my early twenties my life changed quite dramatically and I started to introduce myself as Beth, changing it officially a few years later. I'm still known as Helen to family and old friends and you never know, one day I might feel like changing names again! Aww, thank you for such lovely words about my blog (and me!). Well done Beth. You have put a lot more effort in than I did and I had to have a lie down after composing mine.